The Israeli newspaper, Haaretz, has affirmed that Israel is seeking to resolve the fate of the northern Jordan Valley by systematically expelling the native residents from their homes and gradually annexing their areas. 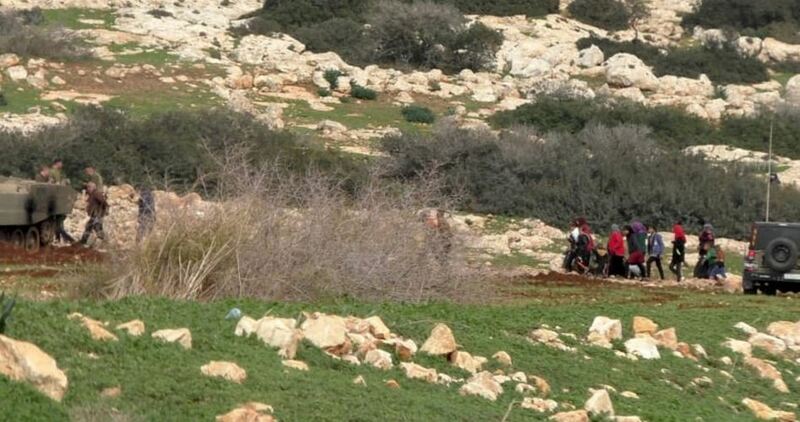 In a report published on its website on Friday, Haaretz said that the Israeli army displaced last week the residents of Khirbet Ibzik village from their homes and destroyed their property and cultivated fields during military drills. In the past month alone, the residents of this little community were ordered to abandon their crude homes multiple times. Aref Daraghmeh, a field researcher for the human rights organization B’Tselem, the Bedouin communities in the northern Jordan Valley had been ordered to evacuate their homes at least 100 times in the past five years, adding that the shortest eviction lasted five hours and the longest 24 hours. Over the past three months, the Israeli army had destroyed several Bedouin communities in the northern Jordan Valley and dismantled many renewable energy and infrastructure projects financed by the European Union for the local residents there. Abdul-Razzaq Qassoum, head of the Association of Algerian Muslim Ulema (scholars), said that the Palestinian cause is the “indicator” used to judge Arab officials in their international relations. In press remarks to Anadolu news agency, Qassoum said that those who let down the Palestinian people and their national cause have a questionable sense of belonging [to the Muslim nation] and shakable faith. 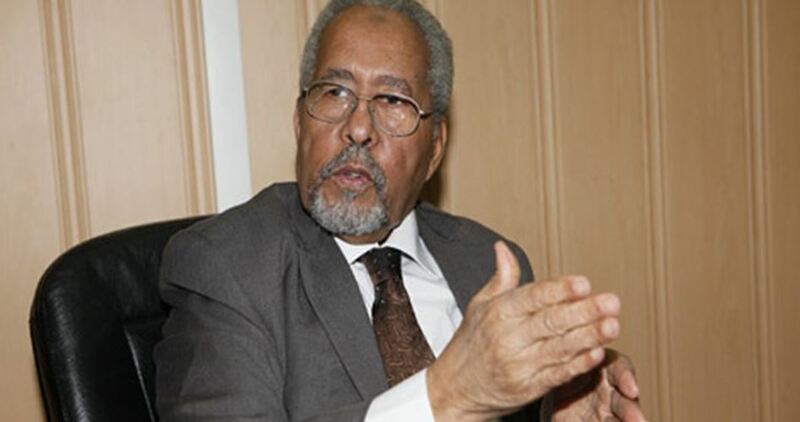 The Algerian scholar was commenting on recent official visits made by Israeli officials to Arab countries and their meetings with leaders and official figures. “The gauge used to judge any Arab official in his international relations is the Palestinian indicator. Today, there is no issue deserving more support and solidarity than the Palestinian question,” the scholar said. “Whoever puts his hands in the hands of those who kill our children, torment our heroes and imprison our women is a traitor to our blood and turns his back on the provisions of our holy Qur’an and the consensus of our nation,” he underlined. The Israeli occupation forces on Saturday threatened the family of the Palestinian prisoner Omar al-Barghouti to deport them from Kobar village in Ramallah unless they turn their son Asem al-Barghouti in to the Israeli authorities. The Israeli occupation forces after midnight stormed Kobar village, raided and searched Palestinian houses, and arrested Asem’s 17-year-old brother Mohammed. A large military force, accompanied by senior intelligence officers, broke into the house of al-Barghouti family and threatened to deport them to Jericho if their son does not appear in three days. The Israeli forces accuse Asem al-Barghouti of carrying out a shooting attack and killing three Israeli soldiers less than a month ago. Violent confrontations broke out in the village during the Israeli raid. Dozens of children and women were transferred to hospital as they choked on teargas fired by the Israeli soldiers. In a press release, the group of Dahlan affirmed that such practice by Abbas is only aimed at starving the Gaza people and hijacking their rights that are protected by all laws. “Cutting off the payment of salaries is an act of terrorism par excellence and inextricably linked to Abbas’s recurring downfalls and the failure of his policies and positions that have made him under suspicion nationally and confirmed his involvement in the plan aimed at separating Gaza,” the group added. Following the death of a 4 year old child in Gaza, at the hands of Israeli snipers, not one mainstream corporate media organization bothered to go and interview the family and find out what happened, in fact, most didn’t cover the story at all. Linked below is an exclusive interview, from the Gaza Strip, with the family of the four year old victim of Israeli sniper fire. On the 11th of December 2018, a 4 year old child named Ahmed Abu Abed, died in hospital in Khan Yunis (Southern Gaza). The four year old child was shot in his fathers arms, during that Friday’s demonstrations against Israel, inflicting shrapnel wounds to his eye and his fathers hand. Wafa Al-Udaini, a Gaza based journalist, took the initiative to visit the family of Ahmed Abu Abed and interview them on their loss. The original plan was to conduct a live stream interview, whereby Wafa Al-Udaini and Robert Inlakesh would interview the family together. However, due to technical difficulties this became impossible. The interview below is an exclusive and something that you will not see anywhere else in English. Israeli occupation on the evening of January 4th returned the body of an underage teenager it killed in November and held for 45 days. 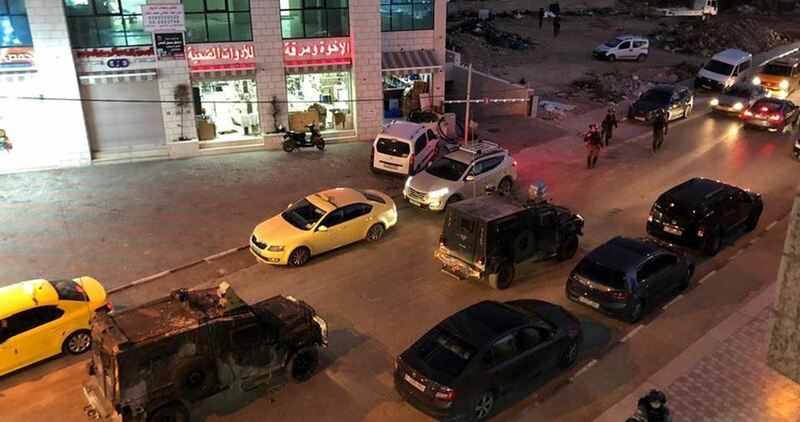 Although the victim was from Jabal al-Mukaber in occupied East Jerusalem, the body was handed over at a checkpoint in Bethlehem district in the occupied West Bank. 17-year-old Abdul-Rahman Abu Jamal was shot and critically wounded by Israeli occupation police officers after he climbed over the fence surrounding occupation police station in Jabal al-Mukaber neighbourhood of East Jerusalem on November 14th. Israeli occupation claimed that Abu Jamal had ‘stabbed’ and lightly injured three occupation police officers, while fourth one was moderately injured in friendly fire when the teen was shot. Israeli occupation photograph showing the knife he allegedly used had no blood in the blade but appeared to have some in the handle. Abdul-Rahman was denied immediate first aid after he was shot and instead he was pinned on the ground with someone kneeling atop him, his head being pushed against the pavement with a leg. He died of his wounds on November 20th. Some sources claim that he would have been shot and killed on October 20th, but this is an error. Abu Jamal’s funeral took place late on Friday evening in as-Sawahira ash-Sharqiya village in part of East Jerusalem on the east side of the illegal Israeli Wall. 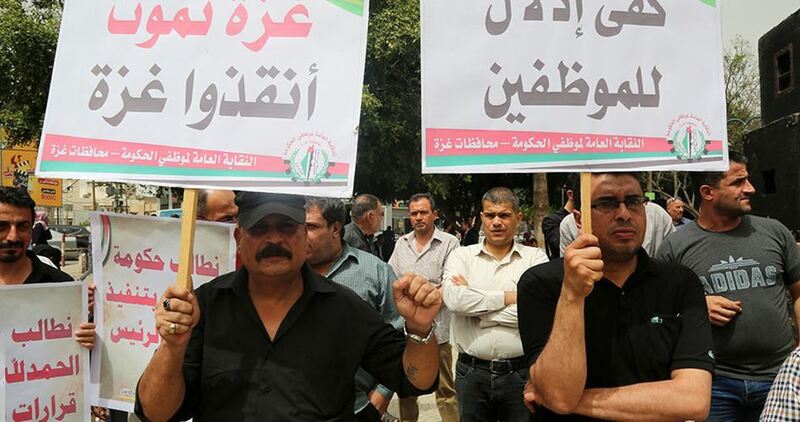 Leaders and representatives of various Palestinian factions condemned Hamas and its security apparatuses, in the Gaza Strip, for attacks against the Fateh movement, its supporters and institutions. Sources in Gaza said that Hamas began an arrest campaign against Fateh movement members, threatening to force dozens not to participate in the 54th celebration of the movement. Earlier Friday, unknown assailants raided the headquarters of the Palestinian Broadcasting Corporation (PBC) in Gaza City, destroying a large amount of equipment, including that used for transmission and recording, in addition to cameras, computers and items of furniture. The assailants also destroyed the archives of recorded tapes, as well as the portraits of President Mahmoud Abbas and late Palestinian leader Yasser Arafat. Government spokesman Yousef al-Mahmoud described the incident as a “barbaric attack by mercenaries and paid squads of chaos” on the official and sovereign bodies of the State of Palestine. Minister Ahmad Assaf, the General Supervisor of the Official Media and the chairman of the Palestinian Broadcasting Corporation (PBC), blamed Hamas, the de facto authority in Gaza, as being responsible for the attack. Assaf personally blamed the chairman of the Hamas politburo and Hamas’ chief in the Gaza Strip for the attack, given the fact that Hamas has been the de facto ruler of the Strip since its takeover of the enclave from the Palestinian Authority in 2007. “This crime comes in conjunction with the Israeli attack on the official Palestinian media. A few days ago, a Palestine TV correspondent was injured [by Israeli soldiers] in Nablus while reporting on the crimes of the occupation. Before that, the Palestinian News and Information Agency (WAFA) was raided [by Israeli army],” Assaf said during an aired interview with official Palestine TV. A statement issued on behalf of the prisoners in Israeli jails warned against the implementation of a plan by Israeli Minister of Internal Security, Gilad Erdan, to reduce the water allocated to the prisoners and other measures of torture. The statement described the plan a declaration of war and threatened that it would be met with a massive uprising inside the prisons. “We, as prisoners, in response to Erdan’s declaration, will stand united to face this attack, armed with a sense of true national unity. We call upon our people everywhere and the forces of national and Islamic action to back our movement and support us on the ground,” the statement read. Five Palestinian factions, including Fatah, Hamas, Islamic Jihad, the Popular Front, and the Democratic Front for the Liberation of Palestine, signed the statement. 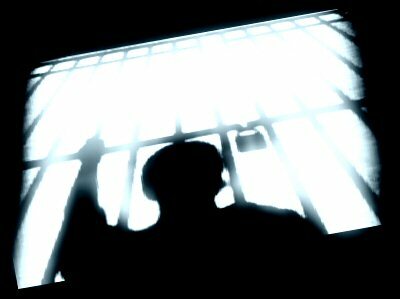 Erdan announced on Wednesday several new procedures that could worsen the conditions of Palestinians in Israeli prisons. The tough measures include rationing water supply, blocking Palestinian Authority funds, banning prisoners from cooking food for themselves, reducing autonomy given to Palestinian prisoners and ending separation of prisoners belonging to rival Palestinian factions Hamas, Fatah, and Islamic Jihad Movement in Palestine. The Israeli court of Ofer has sentenced Palestinian teenager Dawoud Manasrah, 19 years old, to 11 years imprisonment and a financial compensation of 270,000 shekels ($73,000), or an additional three-year imprisonment in lieu of the compensation, according to the Detainees and Ex-Detainees Affairs Commission. The Commission added that the court also sentenced Manasrah to a fine of 10,000 shekels ($3,000). Manasrah was detained by Israeli occupation forces in mid-2015, after he allegedly attacked and injured an Israeli soldier at Beit Enoun junction, to the east of Hebron City, in the West Bank. The Commission, which is the official Palestinian Authority-linked body that cares for Palestinian political prisoners in Israeli jails, condemned the sentence and the exorbitant financial compensation imposed on Manasrah and other political detainees in Israeli prisons. “This proves the barbarity of the fake Israeli judiciary which goes hand in hand with the policies of the Israeli intelligence, aiming to inflict the greatest damage and sanctions on the Palestinians,” the Commission said, in a press release. Several Israeli bulldozers raided eastern Rafah City, in the southern besieged Gaza Strip, on Friday morning. 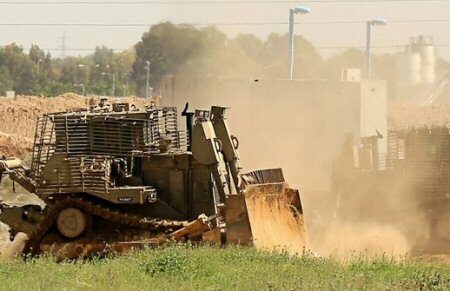 Witnesses told a Ma’an reporter that three Israeli D9 military bulldozers and an excavator raided dozens of meters into Palestinian lands in eastern Rafah City, coming from the Sufa military base and heading towards Khan Younis, raiding and leveling lands. The Israeli army also regularly detains and opens fire on unarmed Palestinian fishermen, shepherds, and farmers along the border areas, if they approach the buffer zone, as the authorities have not made clear the precise area of the designated zone. The practice has, in effect, destroyed much of the agricultural and fishing sector of the blockaded coastal enclave, which has been under Israeli air, land, and sea blockade for 10 years.